May | 2013 | Receiving. 53-year-old man presents to the ED complaining of dizziness. His symptoms started approximately 30 minutes prior to arrival. He had some mild abdominal pain initially, which felt like “one of my gallbladder attacks”, although it was located in the epigastric and left upper abdominal regions. The pain has improved, but his dizziness persists. He describes it as feeling lightheaded and like he is going to pass out. The room is not spinning. He has no headache, no vision loss and no hearing loss or tinnitus. He denies any focal weakness or numbness. Upon arrival his triage blood pressure is 68/34 with a heart rate of 60 and he is triaged as a medical code. Review of systems is otherwise negative. The patient is immediately placed on cardiac and pulse oximetry monitoring. IV is established and labs are drawn by nursing staff. IV fluid boluses are initiated. Orthostatic vitals signs are then obtained. This is not tolerated well due to extreme positivity (50/30 standing). Bedside abdominal ultrasound is performed. There is no free fluid identified. Aorta is normal in caliber. There is no pericardial effusion. The patient is moved to the module pending laboratory studies. In the medical module, the patient experiences intermittent episodes of dizziness despite Trendelenberg positioning. During these episodes, his heart rate drops to the 40s, blood pressure approximately 60/40. Atropine 0.5mg is given , increasing his heart rate to the 50s. The decision is made to place a central line and repeat the CBC. MICU is consulted. During the placement of the central line, the patient experiences tenesmus and passes loose, dark brown stool. Hemoccult is repeated and is again negative. The patient begins to experience increasing generalized abdominal pain. Bedside ultrasound is repeated, demonstrating blood in Morrison’s pouch and behind the bladder. The patient has developed generalized abdominal guarding and rebound tenderness. Blood products are ordered by massive transfusion protocol. General surgery is consulted. The patient is moved to resuscitation as RBCs and plasma are manually pumped. He is taken to the CT scan accompanied by the surgery senior resident and then immediately to the operating room. 1) Which is true of non-traumatic splenic rupture? 2) Which is true of infectious etiologies of splenomegaly? 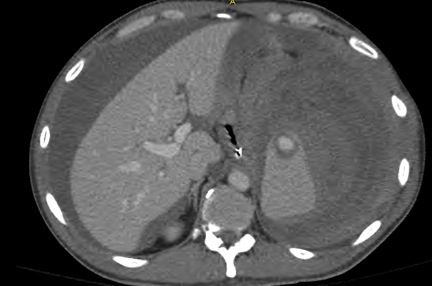 Non-traumatic splenic rupture is rare but life-threatening. The majority of cases occur in the presence of identifiable pathology, such as hematologic malignancy, infection, infiltration (amyloidosis) or connective tissue diseases. Worldwide, malaria is the most common cause. In the US, mononucleosis is most common. Chronically enlarged spleens are less likely to rupture than acute cases. In the event of rupture, symptoms may include vague LUQ or epigastric abdominal pain, pain radiating to the left shoulder (Kehr’s sign), tachycardia, abdominal pain with peritonitis, lightheadedness, hypotension and potentially other signs of hemorrhagic shock. Malaria-related splenic rupture is most common in the acute and primary infection. In mononucleosis, 50% of patients will have splenomegaly. In either infection, small inciting events such as coughing or vomiting can cause significant rupture. Although cases of large rupture with hemodynamic instability must be surgically managed, smaller tears and hematomas may be managed conservatively with observation. Splenic artery aneurysms are most commonly associated with pregnancy, due to the increased AV shunting to the splenic vasculature. Most cases are asymptomatic, and symptoms (LUQ or epigastric abdominal pain) indicate need for intervention. The majority of splenic aneurysms are less than 2 cm in size, making diagnosis by physical exam difficult. Diagnosis is most often incidental by ultrasound or CT, with confirmation by angiogram. While only 2% of splenic artery aneurysms lead to life-threatening rupture, 95% of the ruptures occur in young pregnant women, carrying a 70% mortality rate if they do rupture during the pregnancy. Case conclusion: The patient was taken to the operating room for splenectomy. Pathology revealed wall rupture of an intra-splenic artery and associated hematoma without any other identifiable abnormality. The patient required no further post-surgical transfusion of blood products. He improved quickly and on post-operative day #3 was transferred to his primary health care team’s hospital for evaluation and further management of possible acute versus chronic endocarditis of his aortic valve. – Becker, J. et al. (2006) Essentials of Surgery. Philadelphia: Saunders Elsevier. – Marx, J. et al. (2010) Rosen’s Emergency Medicine 7th edition, Volume 1. Philadelphia: Mosby Elsevier. A 40 year old man, smoker with no past co-morbids presented to DRH with left facial swelling, sudden loss of vision, HA, and nausea. Symptoms started 10 days prior with mild headache and otalgia. There was no history of trauma. He was treated with analgesics but symptoms worsened. No prior history of otitis media or sinusitis could be elicited. You see him in mod 2 and notice a well built man with obvious swelling of left face, severe proptosis and chemosis of left eye, left mastoid swelling and left complete ophthalmoplegia. He also had a low-grade fever. Visual Acuity was diminished. The pt had little perception of light with relative afferent pupillary defect. 1) What is the best imaging modality to confirm this diagnosis? 2) Which cranial nerve deficit would be the first expected with this condition? 3) What antibiotic regimen would you use for coverage? Cavernous sinus thrombosis (CST) is life threatening but thankfully rare disorder that can affect a person at any age. This condition happens when a blot clot blocks a vein that runs through a hollow space located underneath the brain and behind the eye sockets. The cavernous sinuses are the most centrally located of the dural sinuses and lie on either side of the sella turcica. These sinuses are just lateral and superior to the sphenoid sinus and are immediately posterior to the optic chiasm. There is a picture below to depict this. This venous system carries blood from the face and head back to the heart. CST is usually caused by an infection that spreads from the face, teeth or sinuses. It can happen from ear or eye infections but less commonly. Studies show that 25% of the time CST was a result of a furuncle that was either removed surgically or squeezed by a patient and it’s contents spread intracranial. The body creates a blood clot to close off the infection, which creates the CST. When it happens there is a high mortality rate of about 30-50%. Prompt recognition and treatment is essential. There are many symptoms of CST. Some include severe headache, proptosis, periorbital edema, APD, fever, vision loss, seizures, and chemosis among others. There are mimics of this condition including acute angle glaucoma, subdural hematoma, spinal epidural abscess and others but history and physical should guide you in your diagnosis of CST. In current practice, computed tomography (CT) scan or magnetic resonance imaging (MRI) with contrast is the modality of choice to confirm the diagnosis of CST and to differentiate it from alternatives such as orbital cellulitis, which may have a similar clinical presentation. MRI with MR venogram (MRV) is the preferred imaging choice as the MRV will show the absence of venous flow in the affected cavernous sinus. With non-contrast CT, thrombosis of the cavernous sinus can be appreciated as increased density. The introduction of intravenous contrast can reveal filling defects within the cavernous sinus as well as thickening of the superior ophthalmic vein. Nevertheless, CT scan findings may be subtle, and a negative CT scan cannot rule out CST reliably when the clinical suspicion is high. Carotid angiography can demonstrate narrowing or obstruction of the inter-cavernous segment of the carotid artery. MRI and CT scan can also show this narrowing and/or obstruction of the carotid artery. Carotid angiography is not ideal in the emergency department as it takes about the same amount of time to get an MRI if not longer and the sensitivity of an MRI is better. Lab analysis is generally nonspecific but the best supporting labs would be CBC w diff showing leukocytosis w left shift, blood cultures likely showing causative organism and maybe LP which would show inflammatory cells. Fungal cultures would reveal fungal source, which is less likely than bacterial except in diabetics or those with chronic sinusitis. PE and imaging are the primary diagnostic tools of this disease. Lateral gaze palsy (isolated cranial nerve VI) is usually seen first since CN VI lies freely within the sinus in contrast to CN III and IV, which lie within the lateral walls of the sinus. Eventually the disease can spread if not treated and one can get contralateral findings. Eventually CN III and IV deficits can happen including mydriasis, ptosis, eye muscle weakness and superior oblique muscle paralysis. Staphylococcus aureus accounts for approximately 70% of all infections. Streptococcus pneumoniae, gram-negative bacilli, and anaerobes can also be seen. Fungi are a less common pathogen and may include Aspergillus and Rhizopus species. Empiric antibiotic therapy should include a penicillinase-resistant penicillin plus a third- or fourth-generation cephalosporin. If dental infection or other anaerobic infection is suspected, an anaerobic coverage should also be added. Recommended treatment is with IV antibiotics for at least 3-4 weeks. Anticoagulation for cavernous sinus thrombosis is recommended at DRH according to our Neuro Intensivist. There has been controversy over anti-coagulation for this disorder. There are no prospective trials looking at the use of anticoagulation for CST. This is likely because the condition is so rare. Some retrospective studies have shown a decrease in mortality and clot further clot formation by anticoagulation. A Cochrane review found 2 small trials involving 79 patients who were treated with anticoagulants. Limited evidence suggests anticoagulant drugs are probably safe and may be beneficial for people with sinus thrombosis. Accordingly, we should consider anticoagulation (especially since our Neuro Intensivist recommend it) with heparin since the goal is to prevent further thrombosis and reduce the incidence of septic emboli. Before starting heparin just make sure the patient does not have an intracerebral hemorrhage or other bleeding diathesis. Corticosteroids may help reduce inflammation and edema and should be considered as an adjunctive therapy. -Duong DK, Leo MM, Mitchell EL. Neuro-ophthalmology. Emerg Med Clin North Am. Feb 2008; 26(1):137-80, vii. 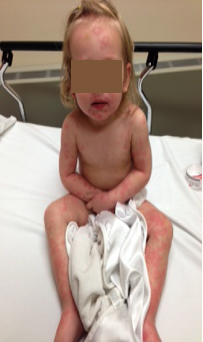 HPI: 3 year-old female presents to the emergency department accompanied by her parents with complaints of worsening rash. The mother states that her child developed the rash 2 days ago. She states that it acutely worsened overnight. The patient reportedly developed a fever overnight of 102.6. She states that she is currently being treated for acute bilateral otitis media. The patient was taken to her pediatrician when the rash was first noticed on the patient’s legs and feet. The pediatrician told the patient’s mother to discontinue using amoxicillin and to start trimethoprim-sulfamethoxazole. The pediatrician stated that the rash should go away after stopping the amoxicillin. The mother states that she gave the first dose of the new antibiotic the evening before the rash worsened. The mother denies any coughing or difficulty in breathing. She denies nausea, vomiting, and diarrhea. The mother states that the patient has not had this type of rash in the past. The mother attempted Benadryl without any improvement of the rash. Skin: Diffuse blanching papular rash not involving palms and soles. Mucous membrane involvement. Majority of lesions in acral distribution however scattered lesions on face, chest, abdomen, and back. Less than 10% BSA skin desquamation. 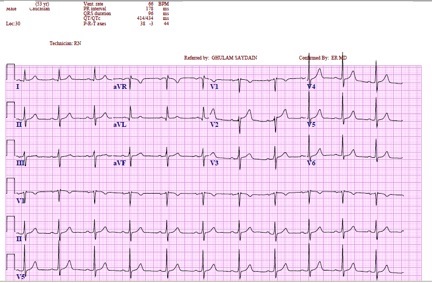 1) What is the diagnosis? 2) What is the probable etiology for this child’s condition? 3) What is the most common cause of Erythema Multiforme? Erythema Multiforme Major constitutes painless blanching target-like papular rash that is usually first noticed on the extremities. This rash spares the palms and soles. Rashes involving the mucous membranes are considered Erythema Multiforme (EM) Major with total BSA desquamation less than 10%. Desquamation rash involving mucous membranes that involves more than 10% but less than 30% total BSA is considered SJS. More than 30% BSA is considered TEN. (A) This rash is not an annular urticarial rash because urticaria usually resolves within 24 hours of its onset. Urticaria will not form target-type lesions. Urticaria most often resolves with antihistamines. (B) Erythema Nodosum lesions are painful erythematous nodules most often occurring on patient’s lower extremities that do not exhibit central clearing. In this case, it is probable that Amoxicillin was the cause of this EM Major rash. HSV is most often the cause EM however the child does not have any vesicular lesions suggesting HSV infection. Common pharmacologic causes of EM are penicillins, sulfonamides, phenytoin, barbiturates, and aspirin. EM does not occur as a result of a Group-A Streptococcal infection. Erythema Nodosum is noted to be a post-streptococcal complication. Urticaria can be a result of an allergic reaction to food however EM has not been linked. Herpes Simplex Virus-1 and Mycoplasma are the most common predisposing factors that lead to the development of EM. Penicillins and sulfonamides result in fewer total cases of EM however the majority of the most severe cases are medication induced. Group-A Steptococcal infections have not been linked to the development of EM. Erythema Multiforme is considered a Type IV delayed hypersensitivity reaction. 1.) A 19 year old female presents with decreased hearing from her right ear since going diving earlier today. Otoscopic exam reveals the findings in the picture, which of the following is an acceptable treatment? 2.) Your next patient arrives with a chief complaint of ear pain and with 45 minutes left in your shift, you know it’s bad form to push it off for the next resident to see. You are dreading having to see yet another cerumen impaction, and are startled to observe the following findings on physical exam. Which of the following is central to management of this condition? 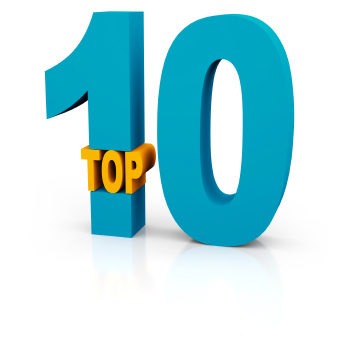 3) Your next patient presents with a foreign body in the ear. You grab your alligator forceps with 10 minutes left in your shift, but which of the following findings should prompt an ENT evaluation instead of attempted removal by the ED physician? The picture above is of a perforated tympanic membrane. This can occur through various mechanisms, including a direct blow to the ear, blast injury, scuba diving, air travel while having an upper respiratory infection, and more commonly from the traumatic usage of cotton swabs to clean the ear. In the case of this patient, TM perforation occurred during a diving injury. Topical antibiotics, such as d) ciprofloxacin otic solution, can be safely prescribed, especially in this case since the perforation likely occurred in a contaminated setting while the patient was in water. It is important to note, however, that usage of topical anitbiotics in TM perforation is not proven by evidence, but can also be given in cases of external puncture or canals occluded with blood or drainage. Most cases of tympanic membrane perforation heal spontaneously. Larger, more central lesions such as those greater than 25% of the total drum surface area may require operative repair, especially in patients that do not heal spontaneously in 4 weeks. Lesions in elderly patients are also less likely to heal on their own. Topical ototoxic agents should be avoided in perforated TM and includes aminoglycosides like, b) neomycin, and antiseptics and compounds with low pH including c) hydrogen peroxide and acetic acid. Alcohol is also ototoxic and should not be applied. If the clinician cannot fully visualize the tympanic membrane and is unsure of whether it is disrupted and there is an index of suspicion for perforation, it is best to avoid these ototoxic agents. After the diagnosis is made, patients with small isolated tympanic membrane perforation with minimal hearing loss can be managed with avoidance of water exposure for 4 to 6 weeks, possible topical antibiotics in contaminated settings as described above, the recommendation for audiometry within 24 hours, and follow up with ENT within 4 weeks to ensure the perforation is closed and the hearing deficit has resolved. There is no indication for oral antibiotics, a), in a perforated TM with no signs of infection. Patients with more marked hearing loss, vestibular signs such as nystagmus, vomiting, and ataxia, or those with findings consistent with facial nerve injury should have emergent ENT evaluation if possible or within 48 hours of injury. If the mechanism for perforation is secondary to barotrauma, such as air travel with a URI, diving, or blast injury, making the diagnosis of perforated TM can give insight to other injuries. The tympanic membrane is sensitive to changes in pressure and more likely to be injured at lower pressures than any other organ. Some studies suggest that it can be used as a triage tool in blasts with multiple victims, especially with patients that are initially healthy appearing, in order to identify patients that have a higher risk of delayed sequelae including pulmonary or gastrointestinal injury. The picture represents acute mastoiditis, which occurs most likely as a complication of acute otitis media. Acute mastoiditis is more common in children than adults, and the incidence has declined with the use of antibiotics for the treatment of otitis media, and is now relatively rare. The mastoid air cells are connected to the distal end of the middle ear through the antrum. While most episodes of acute otitis media are associated with some inflammation of the mastoid, mastoiditis occurs when the mucous lining of the middle ear lining the mastoid becomes persistently inflamed and purulent material accumulates in the mastoid air cells. 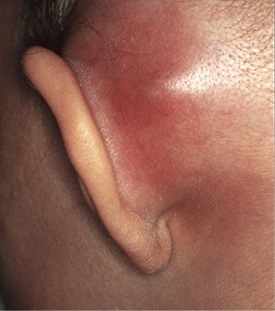 The clinical presentation of mastoiditis can include fever, posterior ear pain, local erythema and tenderness over the mastoid bone, edema of the pinna, and posterior and downward displacement of the auricle. If mastoiditis is suspected, the patient should be a) admitted for IV antibiotics and a CT scan of the temporal bone should be performed. CT scan can demonstrate air-fluid levels and identifies the extent of the disease, but it is important to note that the isolated or incidental finding of mastoid air-fluid levels on CT should not prompt a change in treatment in a well appearing patient without other clinical signs of mastoiditis. IV antibiotics should be directed against streptococcus pneumoniae, the most common pathogen, with consideration for broader coverage against pseudomonas, staphylococcus aureus, and enteric gram negative rods when mastoiditis presents as a complication of a more chronic disease. A third-generation cephalosporin is acceptable as an initial antibiotic choice, and other recommendations include vancomycin, clindamycin, or imipenem. Answer d) outpatient antibiotics with ENT follow up is inappropriate as acute mastoiditis can lead to further intracranial spread and neurological sequelae if not appropriately diagnosed and treated. Choice b) emergency bedside incision and drainage is not an appropriate treatment option for acute mastoiditis. Though an emergency ENT consult is warranted, choice c), an emergency mastoidectomy for debridement of necrotic bone, is not an initial intervention performed and is sometimes indicated if the patient does not respond to conservative therapy with IV antibiotics. A myringotomy by ENT for aspirate and fluid cultures is an appropriate initial treatment choice in order to guide antibiotic therapy and may include placement of a tympanostomy tube for drainage. When removing a foreign body in the ear in the emergency department, the clinician should remember that smaller instruments are more likely to cause damage to the canal so one should use the largest, bluntest instrument that has the capacity to grasp the object or pass a hook behind it. Choice b) live insect, can be safely removed by the ED physician, and the insect should be killed first with solutions such as lidocaine (2% gel or liquid) or mineral oil prior to removal. Though some studies suggest that ethanol causes the most rapid killing of insects, this should not be routinely used because alcohol is ototoxic and contraindicated unless the TM is intact, which is difficult to assess with an insect blocking visualization. Choice a) disk-shaped battery should prompt an ENT evaluation because of its ability to cause burns or liquefactive necrosis of the external auditory canal. The battery’s electrical potential is damaging and does not need to leak or rupture in order to cause damage. Choice c) cotton ball, can be safely removed as long as the object is easily visualized and accessible. Choice d) object present more than 8 hours, is not a definite ENT referral. Some studies suggest that primary ENT referral should be performed for any sharp-edged or spherical object, any vegetable matter or disk-shaped battery, location adjacent o the TM, age less than 4 years, previous unsuccessful removal attempts, and time in ear exceeding 24 hours, all of which were associated with increased complications. Other studies suggest that there is no increase in complication rates related to patient age or the time object is present in the ear. After removal of any foreign body, the physician should perform appropriate inspection of the ear canal for signs of damage to the external canal, TM perforation, or infection, and treat these conditions appropriately.